These come in a few different shapes but all are dealt with exactly the same. Interlocking concrete tiles are the most common roof covering and installation onto them is a straightforward process as they can be removed and reinserted easily. By far most common installation method for interlocking tiled roofs is an on-roof system, using roof brackets (“anchors”) made of stainless steel or aluminium. We use a mounting system by Schletter, a German manufacturer. 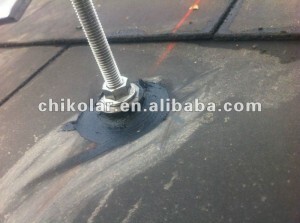 The roof anchors are stainless steel and they fasten directly to the timbers that make up the roof structure. 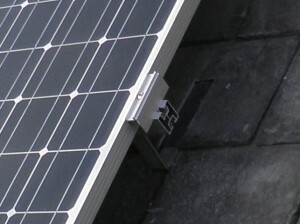 Another installation method involves removing some of the tiles to allow the solar panels to be fitted in their place (in-roof). We use the GSE Integration in-roof system to do this , which uses a system of interlocking plates to create a weatherproof roof covering that the solar panels are then fitted over. In-roof systems provide the best visual finish to the job but are slightly more expensive than on-roof. These again are straightforward to work with but are very brittle. Some older plain tile roofs don’t have felt underneath, which would prevent any sensible installer from fitting solar panels. You should be able to see this from inside the loft, i.e. if you can see the tiles then there’s no felt. We can install on-roof systems onto plain tiles using a Schletter system, but much prefer to build the system into the roof as per the photo of the in-roof system further down this page. because we’ve never done it this way! Slate roofs installations, done properly, are the most difficult type of installation. That choice of words is deliberate as there are several methods of installing solar panels onto a slate roof, some compliant with the requirements of the Microgeneration Certification Scheme (MCS), others non-compliant. In any case, it must be confirmed that the roof is felted under the slates. As with plain tiles, this can be checked from within the loft space. The absolute wrong way to install onto a slate roof is to use hanger bolts. A hanger bolt is a type of wood screw with a machine screw on the other end. To fit them to a slate roof involves drilling through the slates, screwing the hanger bolt in and using silicone sealant to attempt to weatherproof the bolt. This is not a compliant method of installation and no company, despite what they tell you, can guarantee a durable weatherproof seal using silicone sealant. Hanger bolts were never intended for use on slate roofs and are not MCS compliant. 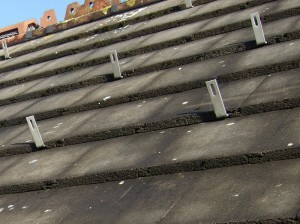 The other method of on-roof installation is to use slate anchors. This involves removing slates and fastening stainless steel or aluminium anchors onto the roof timbers. Slate is very thin and the only way the removed slate can be reinstated is to cut it to allow the roof anchor to protrude through. This is then dressed with a flashing in order to weatherproof the arrangement. The process is more labour intensive and therefore time consuming than hanger bolts, but it is MCS compliant. 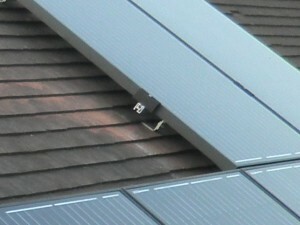 All black solar panels on slate roof with in-roof mounting system. Our preferred method of installation onto slate is the GSE Integration in-roof system. An area of slates is removed and the GSE system is fitted instead, creating a weatherproof roof covering. 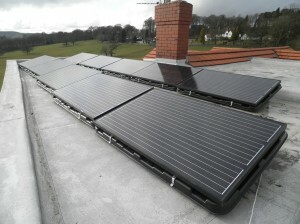 The solar panels are then installed over the top, guaranteeing a weatherproof system and fully MCS compliant. This method of installation has the advantage of being visually much more attractive than any other method, particularly when all-black solar panels are used. In addition, with this system there are no slates left inaccessible beneath the solar panels, hence no maintenance problems in the future. 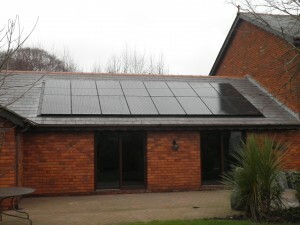 Click here to go to a case study of an in-roof system of solar panels on a slate roof. Many properties have areas of flat roof that get plenty of sunshine. Solar panels can be installed onto flat roofs and systems fall into two categories, ballasted and non-ballasted. Ballasted systems, as the name suggests, are not fixed to the roof but are kept in place by their weight. They often use concrete slabs or stone chippings. The picture to the right is the Console system by Renusol, which is effectively a large ‘bucket’ that each solar panel fastens to. They are made of chlorine-free polyethylene (HDPE), which is robust, UV stable and weatherproof. The benefit of ballasted systems is that they do not require roof penetrations. However, the weight of the ballast needs to be calculated and the load capacity of the roof proven to be satisfactory, which is not always possible. In the case on the left, the roof structure is concrete beams which have a very high load capacity. Non-ballasted mounting systems need to be fixed to the roof. Adequate measures need to be taken to ensure a weatherproof seal where the frame has been fastened down, and of course the location of the roofing timbers needs to be ascertained. In the example on the right, the flat roof was re-done with a fibreglass roof covering prior to the installation of the solar panels, so we had special bearing members fitted that we could screw into. 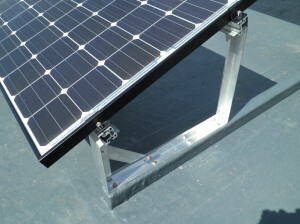 We used a Schucho mounting system that uses aluminium A-frames and rails.